Finished Size: approx. 35" x 38"
The Castles in Spain Blanket is what dreams are made of! This easy-to-stitch pattern features beautiful, varied textures that keep your interest. Perfect for boy or girl. 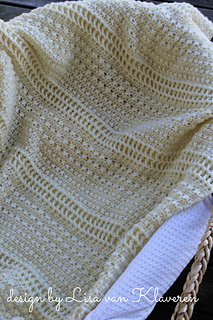 Sample blanket was made using sport weight yarn and crochet hook size F (3.75 mm). You may use yarn and hook of choice with this pattern and make it to any width and length.